Forecast waiting times, dimension the number of "processors" for the expected "customers", for both service of manufacturing processes. 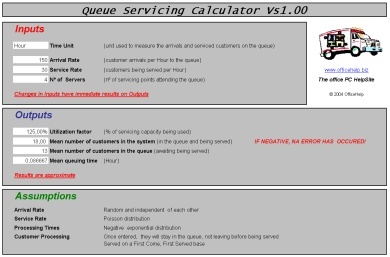 Do you work on a service running waiting queues? Really easy to use, just fill in the values in the Input Cells and check the results on the Output area, immediately. Change the inputs to see the effect of each change. It uses a mathematical formulae and a lookup table to calculate the output values based on the inputs given. Note that the word "customers" may be people or products waiting processing by the system, which may be a service or manufacturing or any other form of process. The time unit may be freely selected. Results are immediate and displayed as soon as any input value changes. The excel document is pre-formatted for printing, pressing the print button is all it's need to print the results. Only one. The calculations use a lockup table that has intervals of values. Input values have therefore to be approximated to the nearest table value and so results are approximate, not absolute. But, unless you require a high level of precision, in which case this is not the software for the job, the results should be close enough. For this reason, the number of servers inputted is limited to: 1, 2, 3, 4, 5 and 10. The input cell is formatted so that only valid values will be accepted. No. Technically, there is no macro code in this file, only a specially prepared Excel sheet with formulas to calculate its Outputs from the values you input. For a general overview of Macro security issues, read this article. To make really useful simulations, change just one input value each time. Register (the easiest way is printing) the output values, then change one (and just one) of the input values to get the new results. Register them again. Compare the effect of each change, to assess the impact of each input variable on the processing capacity of your system. You'll get a good idea on what's need to be done to improve capacity or reduce waiting time and what is the consequences of changes on each of the input parameters. After payment at PayPal, you will get to a confirmation page with a link to download a XLS file containing a Microsoft® Excel file. Click on this link and save the file to your own hard drive. Just open it with Excel every time you want to use it. Losing sales? Still guessing how long you customers will wait? Spending hundreds on specialized software you don't know how to use? 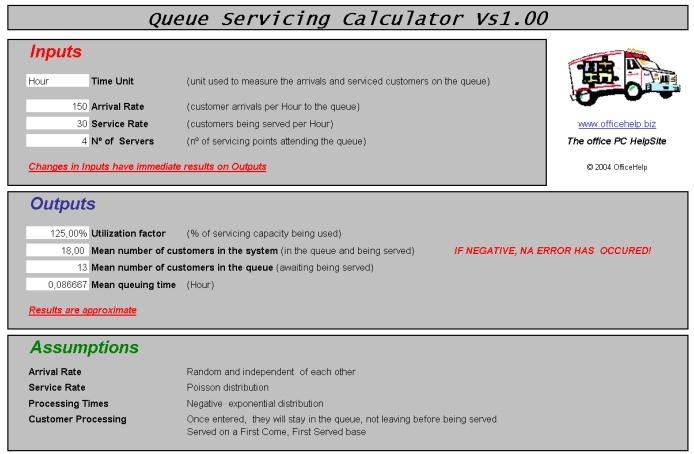 This easy to use Excel macro will calculate waiting times and service capacity. No need to learn new software skills. Start now by using one of the BUY NOW buttons.